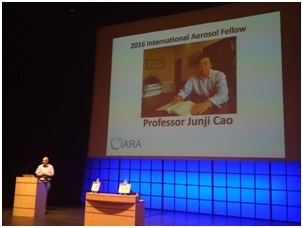 Dr. CAO Junji, professor of Institute of Earth Environment, Chinese Academy of Sciences, won the International Aerosol Fellow Award (IAFA) on September 7, 2016 in 22nd European Aerosol Conference (EAC) in Tours, France. IAFA is a worldwide international award in the field of aerosol science and technology given every two years since 1990 and is sponsored by the International Aerosol Research Assembly (IARA). This award recognizes the outstanding contributions of aerosol scientists. IAFA rewards no more than two scholars each time. CAO Junji is the first prize-winner of the award from China since the establishment. Co-winner in 2016 EAC, Dr. Kaarle Hameri, is a famous Finnish aerosol scholar, former President of the IARA. Dr. CAO Junji, Research Professor and Executive President at the Institute of Earth Environment, Chinese Academy of Sciences (IEECAS), has about 20 years of experience in conducting air quality studies and performing statistical data analysis. He got his PhD from Chinese Academy of Sciences in 2001. Dr. Cao is the principal author or co-author of 300+ papers on ISI with total SCI citations of 8000+ and H-index is 43. He was the President of Asian Aerosol Research Assembly in 2011-2014. He currently serves as the vice President of Chinese Particuology Society. He got several prestigious awards including Frank A. Chambers Excellence in Air Pollution Control Award (2103), AARA (Asian Aerosol Research Assembly) Fellowship Award (2104) and the Second class of National Natural Science Award of China (2012).